The collective sale of the former Amber Park condominium was probably one of the most talked-about deals in the whole of 2017 as it was sold for a whopping $906.7 million (or $1,515 psf ppr) to mega real estate developers, City Developments (CDL) & Hong Realty. Among all other properties in East Coast which were also sold via a collective sale during the same year, Amber Park was deemed to be one of the last freehold sites with a land area of more than 200,000 square feet in the Amber Road precinct. Not only it made the headlines for the overall transaction amount (which most market watchers thought it was bullish), but also the number of parties who were bidding for the sale; a total of 8 bids were received for Amber Park. At that point in time, the property market was on a collective sale ‘frenzy’ as developers were eagerly trying to replenish their depleted land banks after laying low for 3 years between 2014 – 2016. So, after more than 1½ years later, CDL is finally ready to launch the new Amber Park condominium. And knowing what they are capable of delivering when it comes to developing high-end residential projects, expectations will be huge from the affluent prospects. Let us take a look at what Amber Park has to offer and whether is it a good buy. The developer of Amber Park needs no introduction. It’s none other than City Developments Ltd (CDL) – one of the most renowned and reputable property developers in Singapore. The old Amber Park was bought by one of CDL’s real estate arm, Cityzens Development, together with Hong Realty via the collective sale. A quick fact is that CDL was actually the original developer for old Amber Park condominium – constructed back in the 1980s and now it will have another opportunity to redevelop this site along Amber Gardens into yet another exemplary real estate in Singapore. CDL was established back in 1963 as a small office, staffed with only 8 employees in total and the operations of the firm was all about acquiring, developing and selling properties. In just a short span of 2 months, the company was publicly listed on the former Malayan Stock Exchange. CDL completed the company’s first housing development in Johor Bahru in 1965 – called Fresh Breezes and it was then the concept of ‘showflat’ was first originated. In 1972, the controlling stakes in CDL were acquired by Hong Leong Group and began to diversify into other real estate businesses. For more than 50 years, CDL has built up an impressive track record with a well-planned diversification into various real estate segments other than residential – such as commercial and hospitality. Currently, it has a huge network of over 300 subsidiary firms and associated companies under the CDL brand, including 7 other companies which are listed publicly on notable stock exchanges in Hong Kong, Philippines, London, and New Zealand. For savvy homebuyers and the affluent class, CDL has been mainly well-known for developing high-end and top quality private homes. Some of the existing luxury condos by CDL include New Futura, South Beach Residences and Boulevard 88. 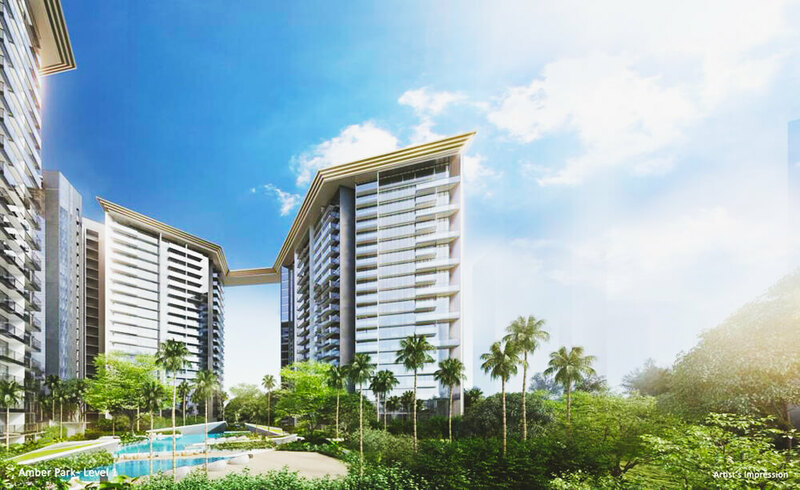 Amber Park is located along Amber Gardens and Amber Road with a coveted address of 16/18/18A Amber Gardens – just next to King’s Mansion and the Chinese Swimming Club, and diagonally across One Amber condo and The Esta condo. Situated with the heart of the prestigious District 15 of Singapore, Amber Park is set to be the next iconic private condominium in the East Coast region. As they always say, location is the key consideration when it comes to buying a property. At Amber Park condo, the essence is truly in its location. It may sound a little exaggerating but over decades, the residents in the East Coast precinct have been deprived of having an MRT station nearby. Thus, if you are living in the precinct, it would definitely be better for you to own a car because it can be quite inconvenient getting in and out of the estate. The wait was finally over when the government made the announcement of the new Thomson-East Coast MRT line (TEL) back in August 2014, which will provide commuters a direct route from the eastern region to the northern region of Singapore. This news has sparked a lot of joy for the East Coast residents. As you can see from the location map above earlier, the upcoming Tanjong Katong MRT station (which will be part of the TEL) is just mere 2 to 3 minutes’ walk away from Amber Park condo. With this added convenience, traveling around Singapore via train would be an absolute breeze – especially for those who travel to the downtown or business district of Singapore on a frequent basis. Looking at the MRT map, you can see that the Tanjong Katong MRT station is just a couple of train stops away from some of the prominent stations in the Central Business District (CBD) and Marina Bay Financial district of Singapore – which should take you just less than 15 to 20 minutes. The Tanjong Katong MRT station will be due to begin operations by 2023, which will be almost the same time when the new Amber Park condo will complete its construction. With the added convenience of having an MRT station nearby, it will be even easier to make your way to the shopping malls and other amenities within the precinct. One of the biggest shopping malls close to Amber Park will be the Parkway Parade shopping mall. It was opened since 1984 and has been a very popular hangout for residents who are mostly living in the East Coast or Marine Parade areas. With Parkway Parade, you will find some of the biggest retail brands, electronic stores, and restaurants serving a wide variety of cuisines. There’s even a cinema operated by Cathay Cineplexes and two major supermarkets by Giant and Cold Storage respectively. Amber Park is also located close to another shopping mall called i12 Katong, Despite being relatively smaller mall as compared to Parkway Parade, it’s still pretty well-received by the residents around the area as the mall offers exquisite dining options and enrichment centers for the young ones. There is also a cinema within i12 Katong, operated by Golden Village. If you are into the local ambiance, you will find a couple of bars and restaurants situated along East Coast Road, Joo Chiat Road, and Tanjong Katong Road. There are usually operating on the first level of heritage shophouses which are mostly inspired by the Peranakan culture. This has always been one of the top considerations for homebuyers who have school-going children when it comes to finding the right property for their family. You’ll be happy to know that Amber Park is located within close proximity to some of the top primary schools in Singapore. Some of these primary schools include Tanjong Katong Primary School, Tao Nan School, CHIJ (Katong) Primary, Haig Girls’ School and Kong Hwa School. However, the bad news is that only Tanjong Katong Primary School is within the 1 km radius from Amber Park – which will offer you that upper hand in proximity advantage when comes to school registration, while the rest are still within the 2 km radius. If you are planning for your children who are about to embark onto secondary or tertiary education, they will be spoilt with choices as there are a lot of good secondary schools and junior colleges in the East Coast precinct. Some of these schools include Dunman High School, Tanjong Katong Girls’ School, Chung Cheng High School (Main), Victoria School, Victoria Junior College, and Temasek Junior College. In addition, there are also international schools near to the Amber Park condominium – such as the Canadian International School along Tanjong Katong Road and Chatsworth International School. 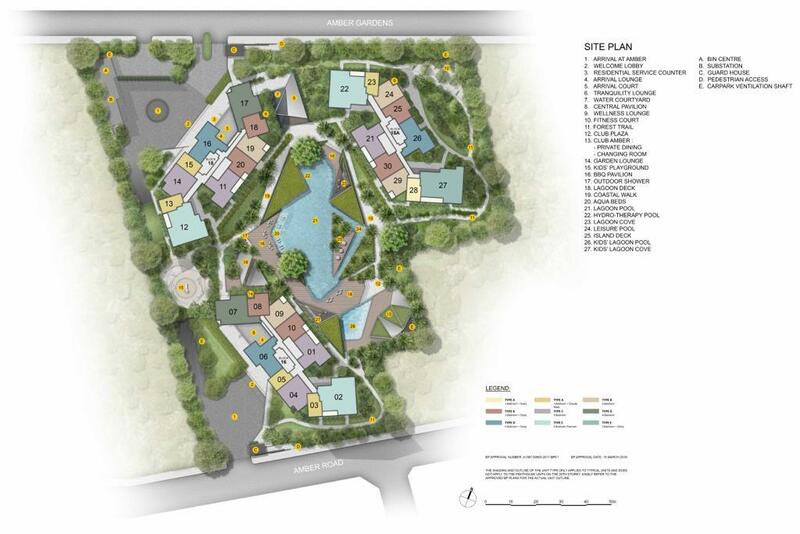 Within Amber Park condo, there will be a total of 36 different facilities for the residents. These include a leisure pool, a lagoon pool, a hydrotherapy pool, BBQ pavilions, tranquility and garden lounges, and many more. Based on the preliminary site plan received, most of the facilities are located on the first floor while the rest will be placed within communal sky garden on the 22nd floor – also known as ‘The Stratosphere’, which links across all three residential towers at Amber Park. 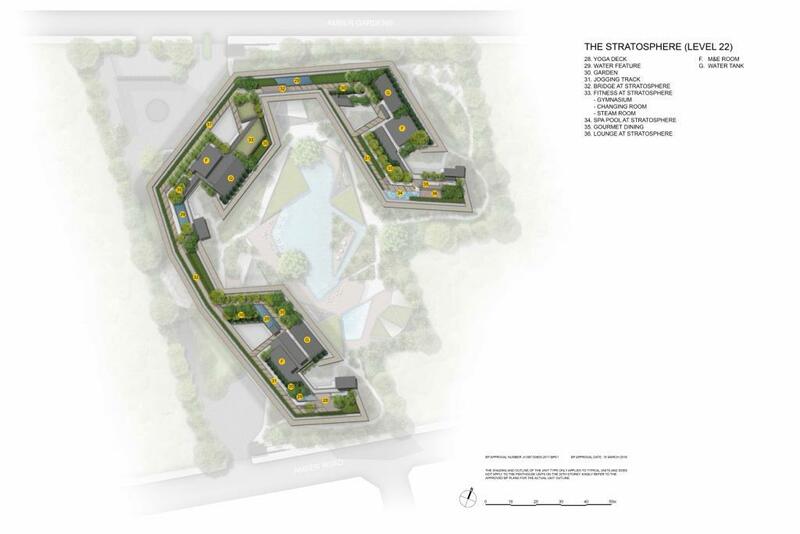 The site plan has also shown that only around 50 percent of the land area has been used for constructing the residential blocks and the other half has been used mostly for landscaping and facilities. It does show that Amber Park is not only just a conventional residential development, but it also offers residents a truly lavish lifestyle living in an upmarket condominium in East Coast. Kudos to CDL and SCDA Architect! Amber Park is not just about the design and quality that CDL is able to deliver. It is also about the sea view when it comes to buying a property within the East Coast precinct of Singapore. That’s also the reason why properties along the Amber Road and Meyer Road areas are always considered as the crème de la crème of East Coast in District 15 because most of these condominiums or apartments are situated along and are the closest to the eastern shoreline. As a result, most of the private homes within these East Coast condominiums will possess a panoramic and unobstructed sea view. In Singapore, we are practically living in a concrete jungle. Thus, owning a unit at Amber Park with sea view on this tiny island is considered exceptionally rare. The appointment of SCDA Architects as the architect of Amber Park didn’t come as a surprise as the firm has been famously known for crafting some of the most iconic luxury condominiums in Singapore. Some of their latest masterpieces in Singapore include Leedon Residence, TwentyOne Angullia Park and Echelon. I’ve always been a big fan of SCDA’s works. It’s like living within a condominium designed by SCDA is like living within a piece of art, and it’s without a doubt that SCDA has the ability to bring out the luxurious shine on Amber Park condo – making it one of the most iconic condos in East Coast. Amber Park condominium comprises a total of 592 units across 3 residential towers (each tower is 21-storey tall) and is expected to receive its TOP by the end of 2023. It will have a wide range of units types from 1-Bedroom + Study to 5-Bedroom + Study. As of 09 April 2019, the developer has not released the Amber Park floor plans yet. Thus, do watch out for this space or you can simply drop us a note below and I’ll keep you posted on the latest information for Amber Park. The official Amber Park price guide has not been released by CDL at this point of time before the official launch. However, if we were to take reference from the en bloc price which CDL paid for the old Amber Park in 2017 of $1,515 psf ppr, units at the new Amber Park may be priced at an average of $2,800 – $3,000 psf. We will update this section as soon as we receive the official indication of the Amber Park price. The Amber Park showflat will be situated in an off-site location along the intersection of Tanjong Rhu Road and Kampong Arang Road – right next to Dunman High School and opposite the Singapore Swimming Club. The opening hours of the Amber Park showflat has yet to be announced. Thus, do give us a call at (+65) 6631-8384 or contact us using the form below, and we will provide you with more details. I would like to view Amber Park and receive priority information on this project. Thanks.